Imagine being able to see the ground beneath your wheels, as if the bonnet was invisible. It sounds like concept car stuff. It was once. Now it’s a reality on the new Range Rover Evoque. ClearSight Ground View gives you a virtual view of the road that’s usually obscured, so you can better see extreme terrain, tight parking spaces or high city-centre kerbs. It’s world-first technology from Range Rover to help you make more of your world – on the road and off it. You might be used to looking at a rear view on your car’s screen. New Evoque’s main touchscreen goes much further, clearly showing you the contours of the terrain by letting you see beneath and immediately in front of the vehicle. Cameras in the front grille and on the door mirrorshelp ClearSight Ground View give a more accurate representation of potential hazards with a virtual 180-degree view at speeds up to 30km/h (18mph). Predicting future tech doesn’t always work out. By now we thought we’d all be living in space. But some brilliant ideas do become reality. 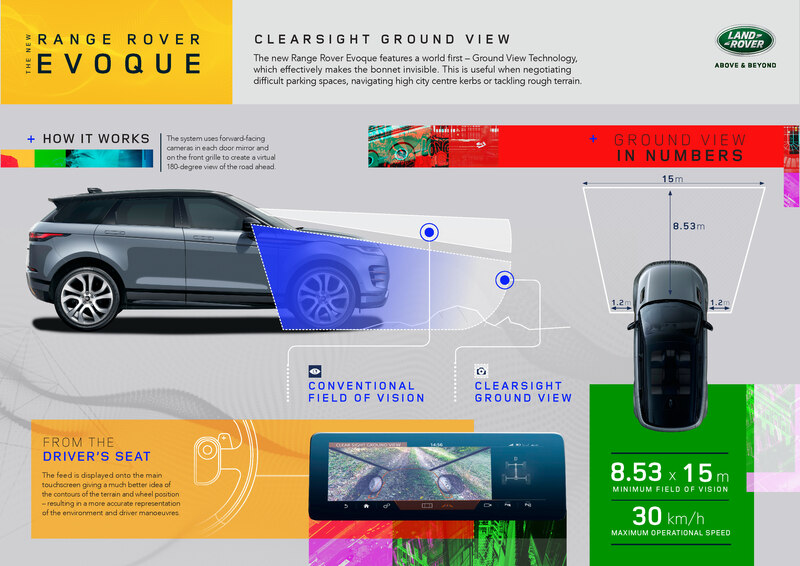 ClearSight Ground View – a development of a system shown on the Land Rover Discovery Vision Concept car of 2014 – is one of them. We have effectively made the bonnet of the new Range Rover Evoque see-through with our ClearSight Ground View technology. Turning this concept into reality shows the commitment and creativity that has helped us make the original compact luxury SUV better than ever. When we revealed the Discovery Vision Concept we said its tech was being developed to offer our future customers unprecedented capability across any kind of terrain. Now those are today’s customers. The new Range Rover Evoque builds on the strengths of the best-selling original. With ClearSight Ground View the first luxury compact SUV is now the all-seeing SUV for the city and the mountains.